In this tutorial, we are going to explain how to Upload/Insert images in the database using Struts 2. First of all, we will add the enctype="multipart/form-data" attribute in the form tag. The enctype attribute specifies how the form-data should be encoded when submitting it to the server. Note:The enctype attribute can be used only if method=”post”. To upload the image in database these JARS are required. Step 1: The very first step is to create a table in the database to store the data and datatype of image column must be BLOB. 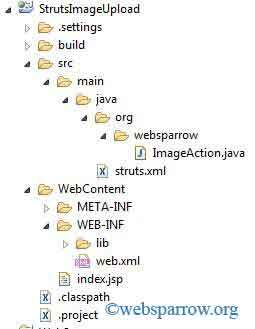 Step 2: Add the struts 2 filters in web.xml. Step 3: Create the Action Class to handle the data. In my case, we have created the database Connection in same class. Now you are all done. Run your application and check the table in the database.